Rowland Suddaby (1912-1972) was born in Kimberworth, Yorkshire.Suddaby studied at the Sheffield College of Art from 1926, winning a scholarship there. He came to London in 1931 aged nineteen, married young, and found it a real struggle to make a living in those early years. However his work was noticed by Rex Nan Kivell and he had a successful show initially at the Wertheim Gallery in London in 1935, who were always ready to give new talented artists a showcase for their work, and then a series of shows from 1936 at the Redfern Gallery. He was regarded by the latter as their artist 'successor' to Christopher Wood, and he painted vigorous and atmospheric pictures in London and Cornwall in the mid to late 1930s some very much in the Wood tradition. These paintings in both oils and watercolours had spontaneity and a sureness of touch which really caught the imagination of critics and collectors alike. After the outbreak of war Suddaby moved with his wife Elizabeth and their daughter Joanna to the Suffolk countryside, settling near Sudbury. He found the landscape and coastline of East Anglia an inspiration for the trademark pictures for which he is now most widely known. Once seen, his paintings of Suffolk fields, ponds, trees and wooden fences, remain in the memory as they are both so evocative of the landscape and so distinctly Rowland Suddaby. During the 1940s and 1950s Suddaby continued his still life painting which also became very popular with visitors to shows at the Leger Galleries and more locally at the Colchester Art Society, of which he was a founder member. By the start of the 1960s Suddaby had become increasingly interested in abstraction and started to experiment with his own work mainly in watercolour and gouache. It is perhaps indicative of the fact that he regarded these works as mainly for his own pleasure and not for exhibition that he didn't sign them. After his death a rich collection of these abstracts came to light, work viewed by his family and others as a very significant contribution to his life's work as an artist. 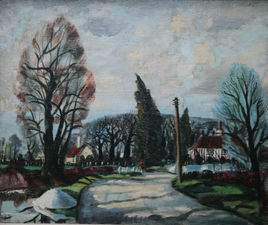 Suddaby's work was acquired by many prominent collectors and public bodies, including the V & A Museum. There are 24 examples in the Government Art Collection alone.